Richard M. Dawkins was due to complete his term of office as director at the end of September 1913. 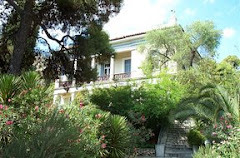 However in this was extended for an additional year (in spite of the suggestion in Helen Waterhouse that his term of office came to an end in 1913). Alan J.B. Wace was offered the directorship in the autumn of 1913, to start from October 1914. Dawkins felt he could resign due to the death of his mother's cousin, the historian John Andrew Doyle (1844-1907). Dawkins inherited Doyle's two houses in Wales: Plas Dulas in Denbighshire and Pendarren near Crickhowell. Dawkins' mother, Mary Louisa, was a granddaughter of Sir John Easthope (1784-1865). One of Dawkins' neighbours in Crickhowell was Harry Pirie-Gordon who was admitted as a student in 1908. Waterhouse, H. 1986. 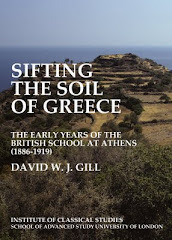 The British School at Athens: the first hundred years. 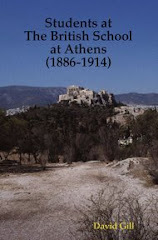 British School at Athens supplementary volume, vol. 19. London: Thames & Hudson.